The government is flying blind when to comes to transporting, and cleaning up, heavy tar sands oil. But this conversation must start with a simple fact: There are too many known unknowns about diluted bitumen. We don't know exactly what's in it, and the government hasn't fully studied how safe it is to transport. Bitumen is a form of petroleum that occurs in a solid, or semi-solid, state: It can be sludgy or even be brittle, like rocks. That’s what is buried deep in the Canadian oil sands. In order to transport this bitumen through thousands of miles of pipelines so that it can be refined, it has to first be diluted, so it flows like a liquid. That diluent is usually a natural gas liquid—but we don’t know for certain what it is. The industry considers its diluent formulas proprietary information and won’t share it with regulators. When the State Department released its first Environmental Impact Statement on Keystone XL, the EPA gave it an “inadequate” rating in part because it didn’t have any specific information on diluents. “We believe an analysis of potential diluents is important to establish the potential health and environmental impacts of any spilled oil, and responder/worker safety, and to develop response strategies,” the EPA said at the time. Researchers and regulators know roughly what’s in dilbit—just not enough. “I think what they don’t know are what the specific chemicals are in any pipeline or any batch, because companies could use different chemicals at different times, depending on what’s cheapest at hand at any one moment,” Carl Weimer, the executive director of the Pipeline Safety Trust, told The Nation. The composition of those chemicals could greatly influence how the dilbit behaves once spilled—whether it sinks or floats in water, for example. In an emergency clean-up situation, that’s really good information to have. And what we do know about the danger of tar sands oil is already disturbing. The State Department’s report does focus on the damaging properties of benzene, and notes that “[b]ecause the diluted bitumen crude oils have a significant amount of lighter hydrocarbons added, they tend to have higher benzene concentrations than many other heavy oils.” Benzene, the report states, “was determined to dominate toxicity associated with potential crude oil spills.” Benzene is an unusually toxic chemical that was found in the air after the Enbridge tar sands spill of 2011, and can cause a wide range of severe physical damage to animals, plants and humans. So the government doesn’t really know what’s in the dilbit once it spills—but it also knows shockingly little about how to prevent these accidents to begin with. Many conservation groups contend, with ample evidence, that tar sands oil leads to more spills because it is “highly corrosive, acidic and potentially unstable." MS. QUARTERMAN: When the integrity management program requirements were first put in place on the hazardous liquid side, I think it was 2000, 2002, there were pipelines in existence that transport diluted bitumen. I don't believe any study was done at that time of the characteristics of the crude. MS. QUARTERMAN: I don't believe it was a part of the equation, no. 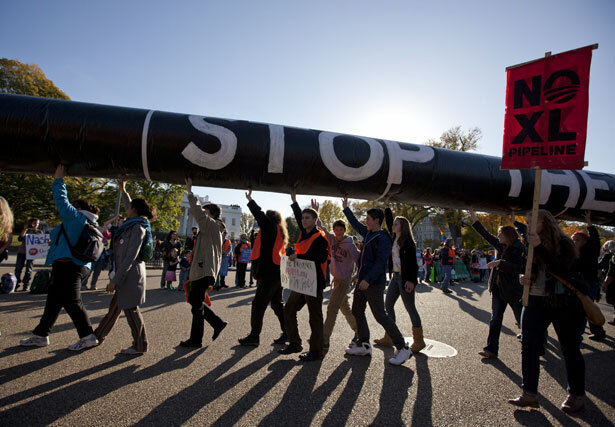 Since that exchange, Congress passed the Pipeline Safety Act, which was panned by many environmentalists as too weak. The bill didn’t update any regulations to include dilbit transportation, but did mandate that PHMSA study the problem and act, if needed. But for now—and for the next several months, and probably years—the government is flying blind about how to transport diluted bitumen. It also doesn’t even know what’s in the stuff once it spills. That’s crucial context when considering whether to build Keystone XL, which would carry millions of barrels of dilbit across the entire country.